Need to grab a quick bite on the run? Now, you have more options, as four new food trucks hit city streets. The latest businesses-on-wheels made a stop at City Hall for photos, and their first customers. 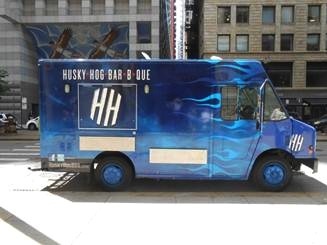 The new trucks include Starfruit — which serves the Kefir yogurt known for smoothies, parfaits, and frozen treats; Jeni’s Splendid ice creams — which serves unique flavored American handmade ice cream; Mar ice cream truck — which offers shakes and sundaes; and the Husky Hog BBQ — the City’s first barbecue truck with an onboard smoker. Although Chicago entered the food truck game behind other large metropolitan cities, in now boasts 120 roving food trucks, 17 of which are licensed to cook onboard. Woodel and her husband, Joseph, launched their business with the help of a $10-thousand microloan from the Women’s Business Development Corporation, a graduate of the City’s Microlending Institute.